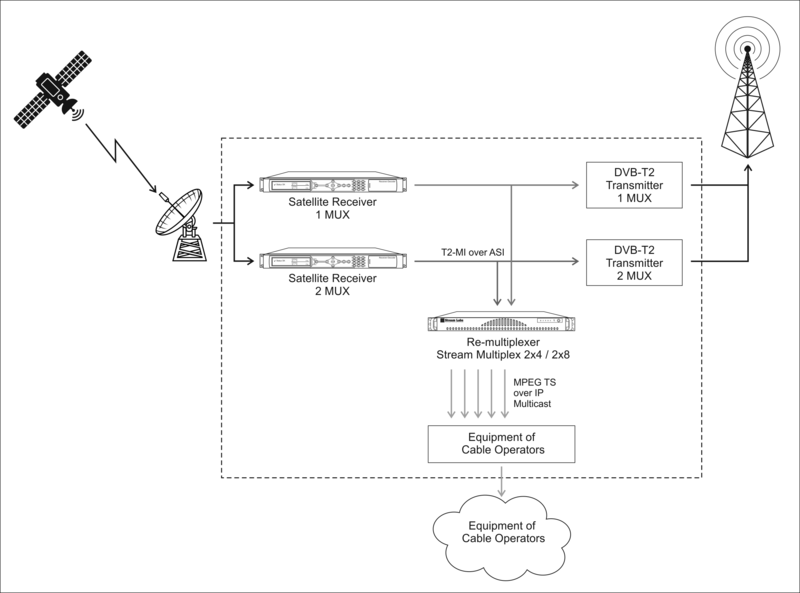 Solution for multiplexing of transport steams MPEG2-TS is used in land-line digital TV broadcast for de-encapsulation of input DVB-T2 MI streams on its components PLP (physical layer of the channel); de-multiplexing of TV services from all PLP with subsequent formation of MPEG2-TS streams with needed set of services. Formation of output streams is done in transport layer without recoding of elementary streams. Constant bitrate for output stream is provided by addition of extra packets and correction of time codes PCR. Device provides formation of SI/PSI tables in output transport streams, based on SI/PSI tables of input streams. 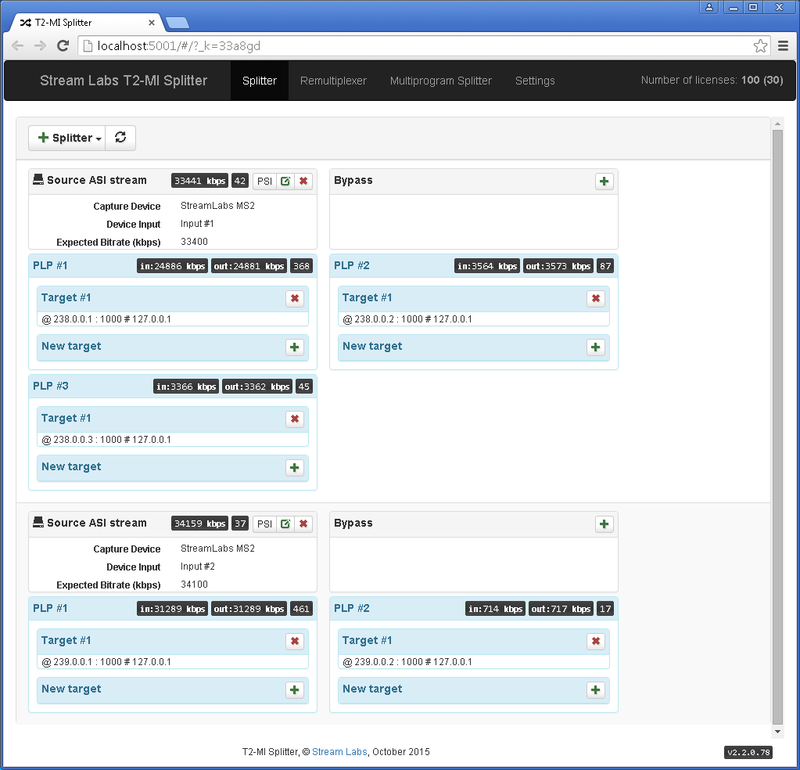 Stream Multiplex includes three main operational modules: Splitter, Remultiplexer and Multiprogram Splitter. Splitter – module for extraction of multi-program transport streams from the physical layer (PLP) of the channel, which are present in T2MI streams, for subsequent transmission them to Remultiplexer, Multiprogram splitter modules. 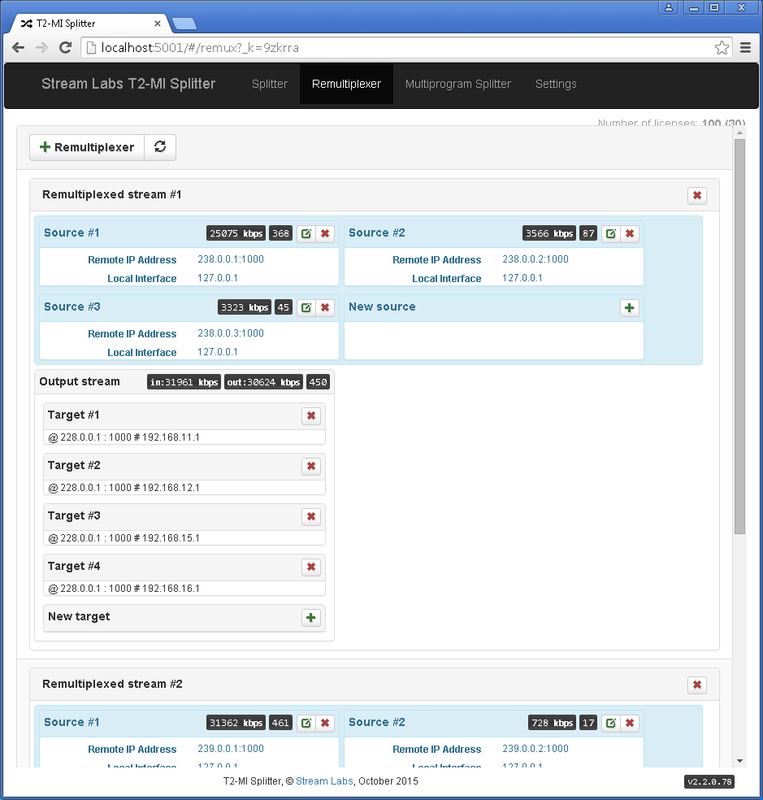 Remultiplexer – module for combining of several input transport streams, usually incoming from Splitter module into one multi-program stream. 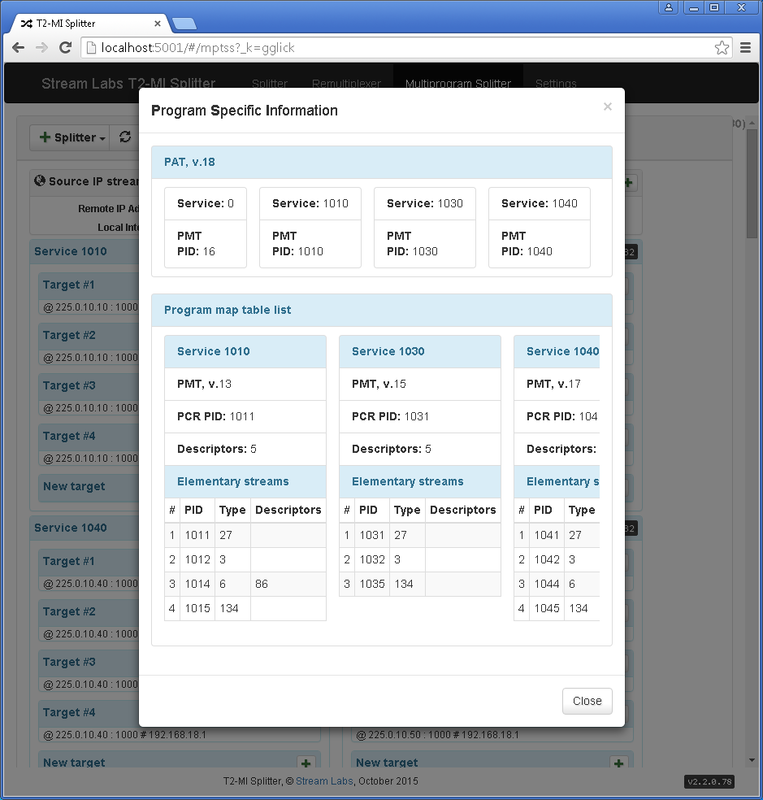 Multiprogram splitter – module for partitioning of multi-channel streams for extraction of some particular services from them; and broadcasting of one of the extracted services as MPEG2-TS. Data exchange between modules is provided via networking capabilities of computer according to specification ETSI TS 102 034 «Transport of MPEG-2 TS Based DVB Services over IP Based Networks». 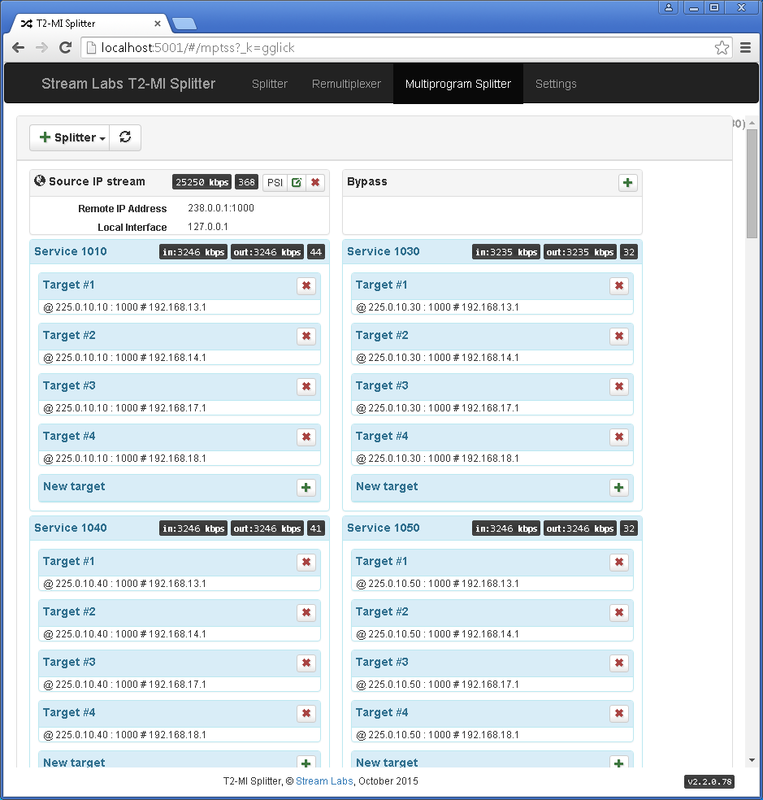 Stream Multiplex provides to end-user WEB interface for control, setup and monitoring of the system. Stream Multiplex executes analysis of values continuity_counter related to header of transport packet. Such analysis is executed for each elementary stream of analyzed transport stream.